I would love to see Kemp lose Georgia. Things keep looking better for Gillum in Flordia. Provisional and absentee ballots have reduced the difference to .18%. The Senate race is also going to recount. Leave it to Republicans to sue because the count will ensure they lose. An additional 120,000 outstanding ballots were made available from Maricopa County Thursday. The county encompasses Phoenix and some of the state's liberal enclaves. There are an 345,000 ballots that needed to be counted per a knowledgeable source with the Arizona Secretary of State's office. Annnnnd now Rick Scott is suiting his own state because the vote count isn't going his way. He is also asked the law enforcement to investigate but they are reluctant to get involved. What a bunch of sorry sack crybabies. 9:05 — Rick Scott is also suing Palm Beach County. Here's the lawsuit. 9:00 — Rick Scott filed suit against Broward County Elections Supervisor Brenda Snipes over the county's delay in completing its count of the votes from the midterm election. Scott sued as a candidate for the U.S. Senate, not in his capacity as governor of Florida. Scott followed up by lashing out at Snipes in an extraordinary press conference at the Governor's Mansion on Thursday night. Broward County lags the rest of the state in completing the first, crucial phases of counting ballots from Tuesday's midterm election. As of 8 p.m. Thursday, the same time the governor summoned reporters to the mansion, Broward County was the only one of the state's 67 counties that had not reported to the state that it had completed its tabulation of early votes. Early voting ended Sunday in Broward. Read the full recap of Scott's press conference here.
" I fully support and commend the Governor for directing FDLE to investigate. The power of the vote is only as strong as the trust in the count. With each new ballot 'found' that trust erodes." 8: 46 — Andrew Gillum tweets his response to Rick Scott's lawsuit. 8:34 — Sen. Bill Nelson responded to Gov. Rick Scott's late-night announcement through a statement from his spokesman Dan McLaughlin. "The goal here is to see that all the votes in Florida are counted and counted accurately. Rick Scott's action appears to be politically motivated and borne out of desperation." 8:31 — "I am proud to be the next Senator for the great state of Florida," Rick Scott said. 8:30 — "Some believe this is simply rank incompetence. That is certainly true," Rick Scott said. But it would be naive to think they are overruling the will of the voters, he adds. I'm not the most optimistic about Georgia...I'd love for Abrams/not-Kemp candidates to get enough that it forces a runoff, but she'll need for getting that far to give her one last bounce of support, or she'll still come up short. Runoff is within reach, I hope she gets it - will she win that subsequent election? That is the question. Similarly, it wouldn't surprise me if Gillum also comes up short for FL governor, as DeSantis's lead was always bigger than Scott's was over Nelson (if not by much). I'd love for a blue sweep of those. Not expecting one, though. Which one is the state where the Republican running also gets to count the votes? Yeah, that's the one the Democrats are shooting a move with. It's funny how things just seem to work out that way, iddint? It amazes me that the Republican candidate NEVER tries to get away with something. God knows it's always a conspiracy against them...those poor, neglected, oppressed Republicans. Sinema has won Arizona over McSally. Voter fraud. Lose a little bit? Just create new ballots. 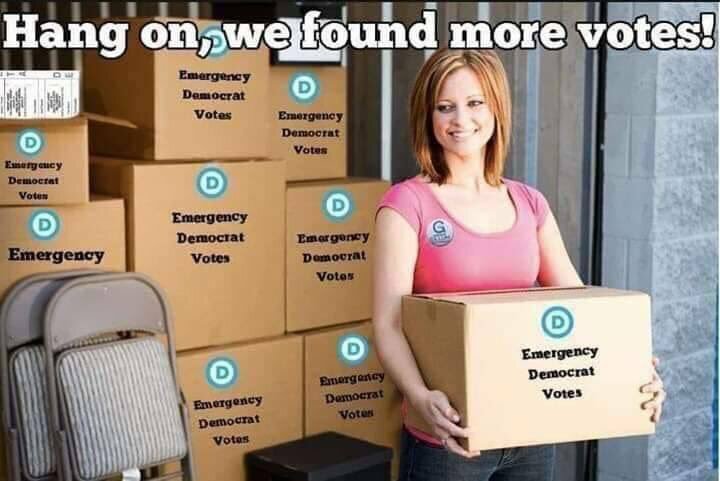 Why do we NEVER hear anything about uncounted ballots until Dems lose by a little? The fact that there no outcry about uncounted ballots and yet they suddenly appear in a close race makes it impossible for me to believe the ballots are legit. Gillums anti law-enforcement positions are beyond radical, and make him unsuitable for any office. Criminals will take over the state while cops get shot or quit. The whole law-abiding majority will lose. Anyone supporting a radical likes him is a traitor working against the safety and vitality of our nation. F*** him and all the treasonists who voted for him. You are all enemies of the people and the first responders protecting us from the people Gilluom will allow to run amok.